The certification of trust in Montana is an affidavit containing sworn statements made by the trustee or trustees of a trust. In a trust arrangement, a settlor entrusts property to a trustee for the benefit of a beneficiary. The trustee is the administrator of the trust's assets. Instead of furnishing the trust instrument (an unrecorded document containing the trust's provisions, including the designation of the trust's beneficiary) the certificate is an abstract supplying only the relevant information required of the trustee in order to prove his authority to enter into a transaction on the trust's behalf. 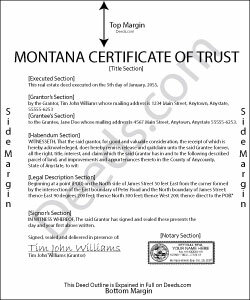 Codified under the Montana Uniform Trust Code at 72-38-1013, the certification of trust contains basic information, such as the trust's name, date, settlor, and each trustee's name and address. The certificate verifies that the trust exists and that the trustee is authorized to act by providing a description of the trustee's powers relating to the pending action. For example, a trustee may furnish a certificate when conveying real property held in a living trust. When used in real property transactions, a recorded certificate fulfills the requirements under Mont. Code Ann. 72-38-1111 for a valid transfer of real property by a trustee. When used for transactions involving real property, the certificate should also include the legal description of the parcel subject to the transaction. The certificate must also designate whether or not the trust is revocable, and who, if any, has authority to revoke the trust. For trusts with multiple trustees, the document also specifies which trustees have signing authority, and how many are required in order to execute the trustee's powers. The certificate also cites the governing law under which the trust was formed. Mont. Code Ann. 72-38-1013 provides that the certificate can be signed by any trustee, and signatures must be acknowledged if the document is recorded. When used in real property transfers under 72-38-1111, each acting trustee must sign before the document is recorded, and the certificate should meet all requirements of form and content for recording documents in Montana under 7-4-2636. Recipients of the certificate can request, in addition, excerpts and/or later amendments from the trust instrument which name the trustee and confer the relevant powers upon the trustee. Requesting the entire trust document exposes the person making the request to certain liabilities ( 72-38-1013(8)). Finally, the certificate contains a statement confirming that the trust has not been modified in any way that would cause the statements made within to be inaccurate, and the recipient "may assume without inquiry the existence of the facts contained" within ( 72-38-1013(6)). Consult a lawyer with any questions and for professional guidance regarding certifications of trust in Montana, as each situation is unique. Vanessa W. said: This site is very useful and reasonable. Comes in handy when you need a deed in other states. Jason James H. said: Th forms were correct, exactly what I needed. Reply from Staff: Thanks Jason, we appreciate the feedback.